News: It’s here. The official 2019 Platter’s selection of South Africa’s best wines. 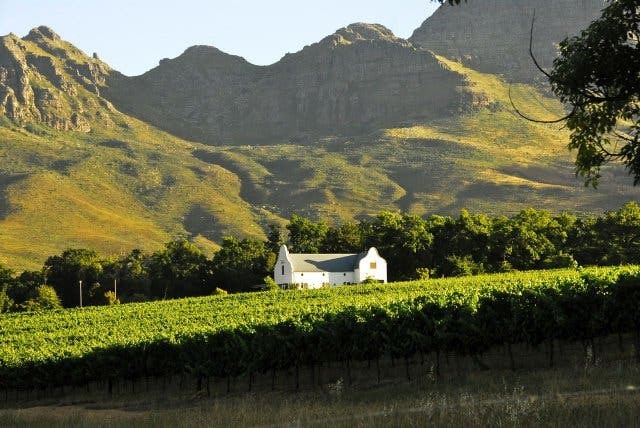 At the foot of the Cape Fold Belt, Stellenbosch's Mediterranean climate means that it’s a primary location for viticulture. Conditions are also perfect for growing the kind of produce that attracts world-renowned chefs to restaurants in the region. 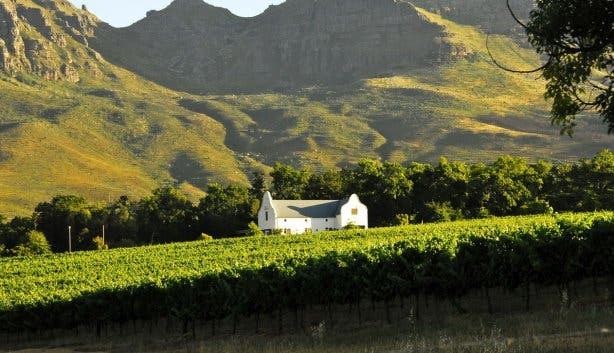 Paired with tranquil surroundings, a visit to Stellenbosch is one culinary experience you shouldn't miss. Tucked away in the picturesque Blaauwklippen Valley, Bodega combines farm-style meals with wine tasting done at your lunch table. Read more about Bodega. 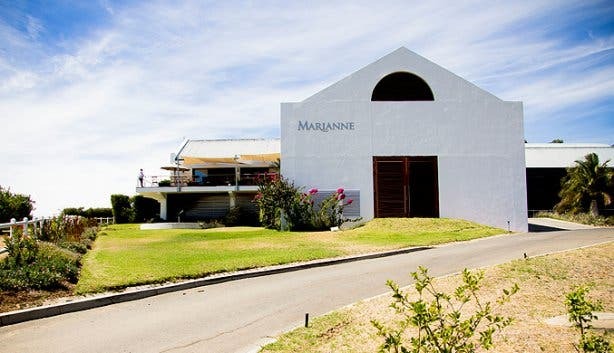 Set alongside the vineyards on Marianne Wine Estate with a pretty pond out front and a fabulous playing area for children on the other side of the building, Floréal Brasserie is a great countryside dining option for the entire family. Chef Ian Lilley adds a European touch to locally sourced ingredients to serve delicious, unpretentious food at great value. Open for lunch and dinner with specials on Friday evenings (steak and live jazz) and Sunday lunch, Floréal also hosts yoga lessons followed by breakfast on Wednesday mornings. 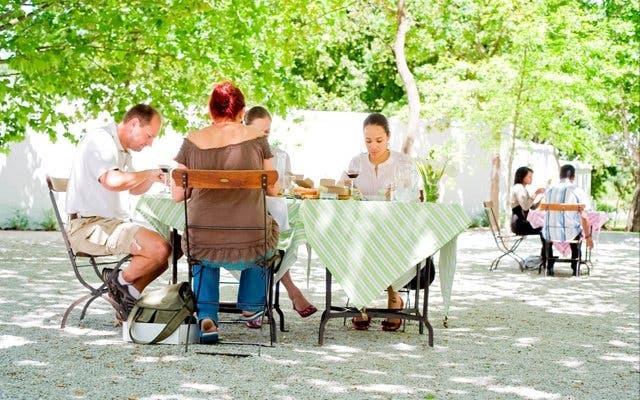 The restaurant also caters for picnics and events. 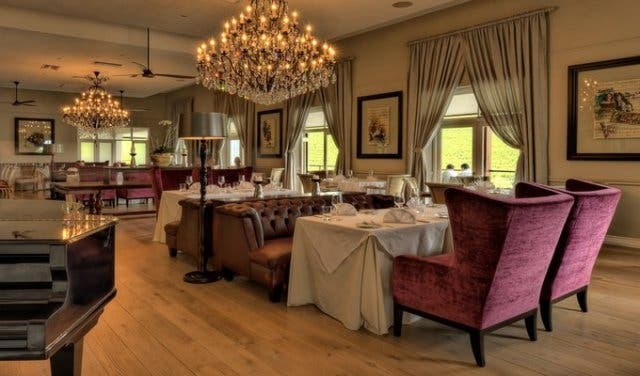 Set under historic oak trees with views of the De Zalze golf course, this restaurant is the perfect setting for a long indulgent lunch or an intimate dinner. Chef Michael Broughton is a master of sauce, his shellfish broth with prawn risotto is legendary. 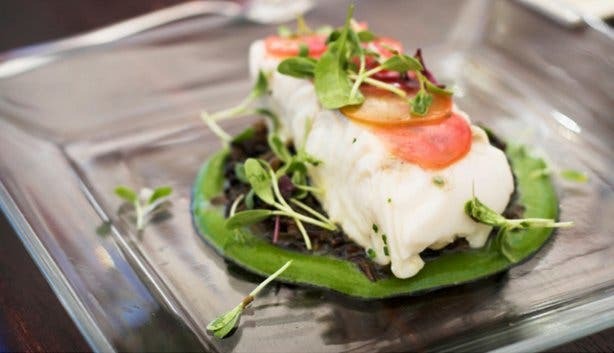 The menu changes daily and award-winning chef George Jardine places great emphasis on presentation and fresh, locally sourced ingredients. 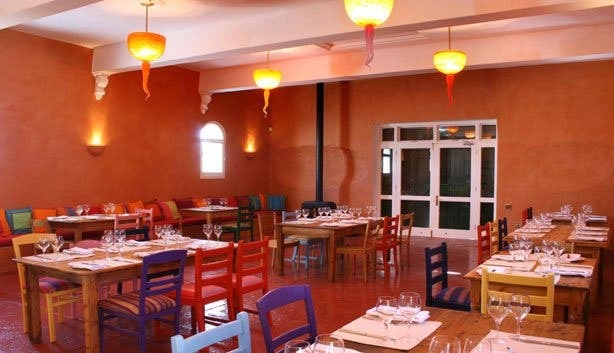 The restaurant offers an â la carte lunch and a six course, set menu for dinner. And as a cherry on top, the estate’s wine is superb. 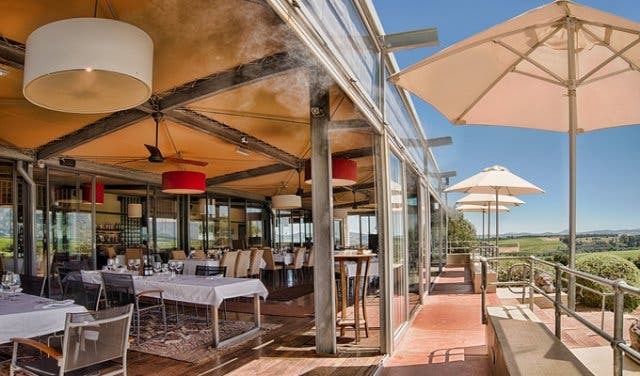 With bespoke artwork and expansive views of Asara's vineyards, Raphael's offers a welcoming atmosphere and creative, European cuisine. 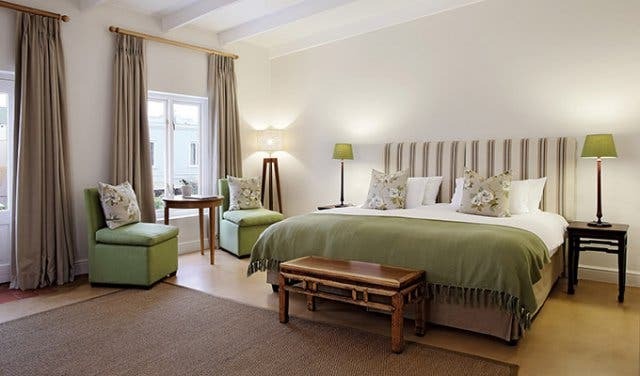 Tucked snugly away on one of the oldest wine farms in the country, the four-star Spier Hotel in Stellenbosch is perfect for anyone seeking a winter weekend retreat close to Cape Town. 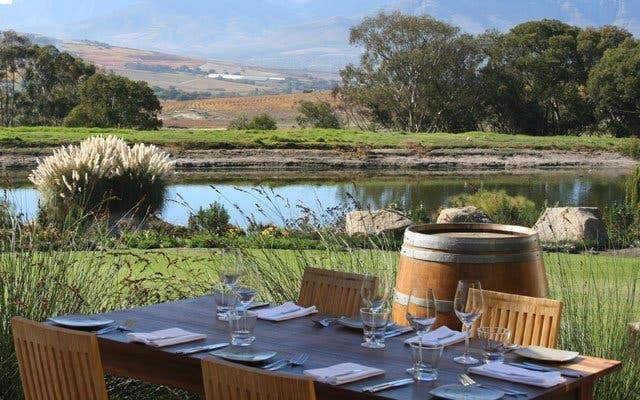 If you're not looking for an overnight stay, day-trippers can sip and sample an assortment of robust reds in Spier’s contemporary wine tasting room (there’s also grape juice tasting for kids) or enjoy hearty, farm-to-table meals at the on-site Eight restaurant or at the elegant hotel restaurant. 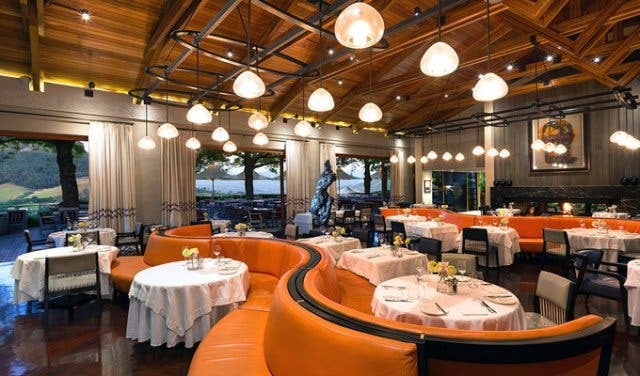 The restaurant uses words like balance, harmony, infinity and abundance to describe its menu and atmosphere. 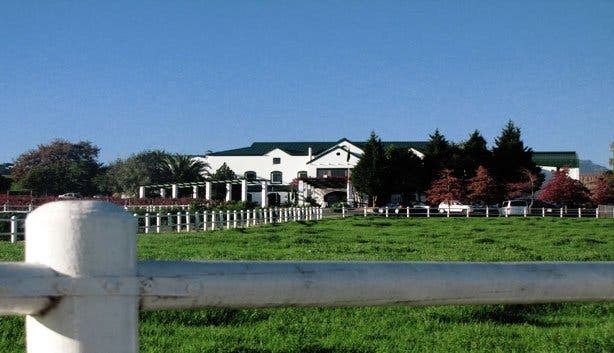 Home of fine wines and fast horses, this inviting restaurant, situated against the Helderberg Mountains, presents a mouthwatering â la carte menu. 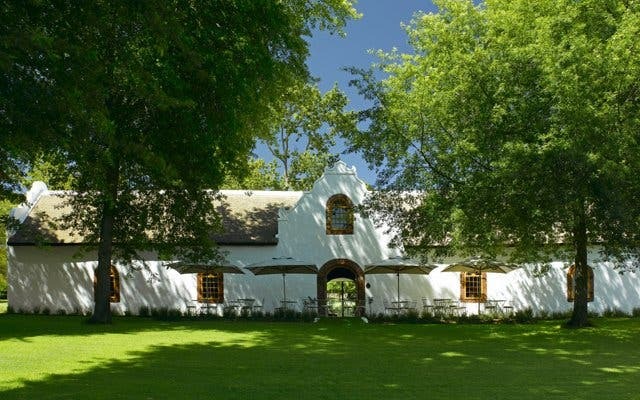 Make a booking for a fireside dinner, champagne breakfast or lazy lunch. Read more about Avontuur. With a backdrop of the Helderberg mountains and contemporary lounge music creating an ambience, you can't help but relax and take it all in. 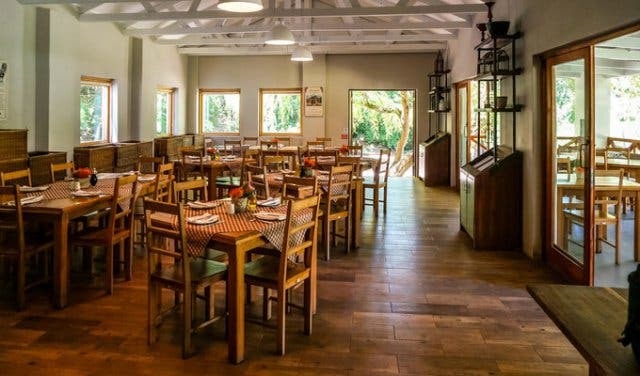 The winery includes a demonstration kitchen, where head chef, Louisa Greeff, whips up meals intended to complement each of the estate’s wines. Much lauded chef, David Higgs, has created a menu with a heady mix of classic French contemporary Asian and South African flavours, for example: Smoked Duck, Burnt Bordeaux Figs, Rooibos Gel and Pistachio Cantuccini is a starter on the current four course menu. There’s also a 6-course menu available. Look out for the hand-crafted crockery by local potter, David Walters. 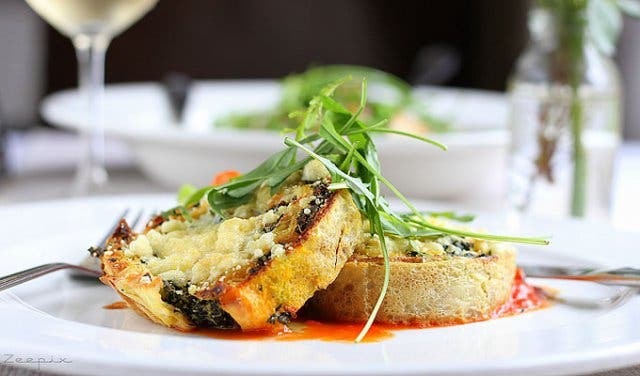 Homely and country-style, the dishes marry simple flavours with well-sourced produce. Try the Chilean salmon with horseradish remoulade. 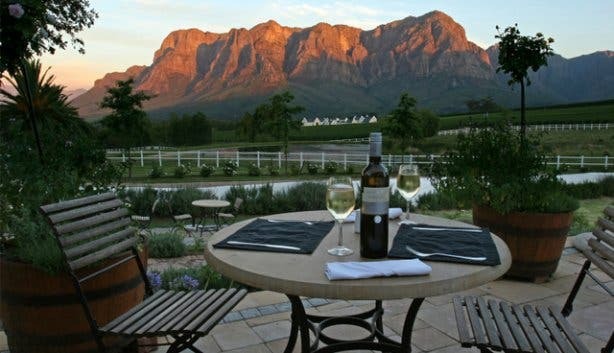 Set on the slopes of the Simonsberg Mountains, it’s just the place to while away the day. The menu offers some old favourites including prawn cocktail and Malva pudding. Get nostalgic in this renovated farmhouse. Expect a fresh take on the classics, such as deboned quail with smoked parsnip mash. 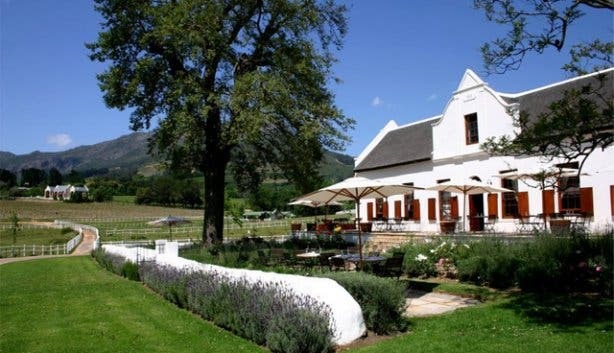 Dine on the terrace under a canopy of oak trees, while enjoying breathtaking views of the Stellenbosch Valley and Mountains. 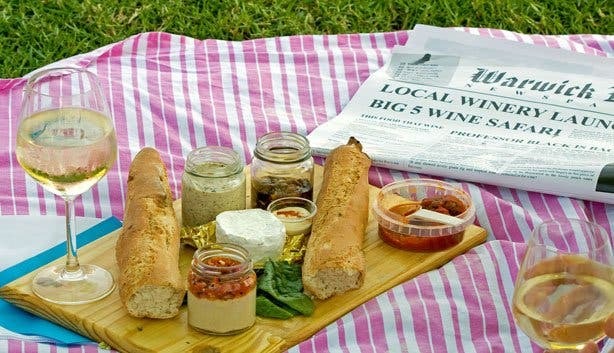 Enjoy a picnic basket with Warwick wines in a picnic pod shaped like a bird's nest. We loved biltong and brandy Pâté, humus with peppadew salsa and a round of Camembert on our visit to Warwick. 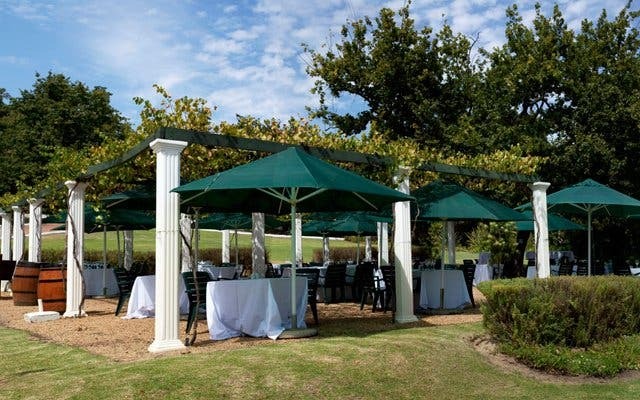 Have a meal or glass of wine on the shaded terrace at Devonvale Golf and Wine Estate. 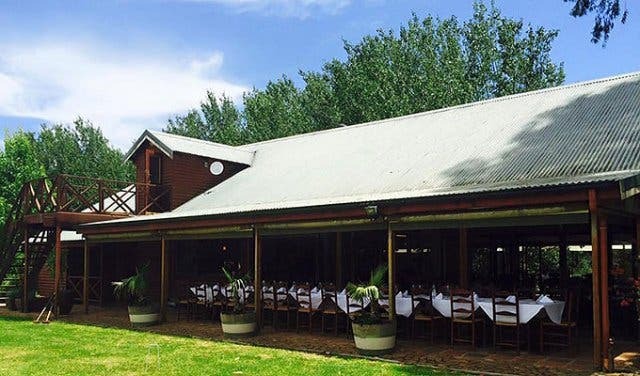 Red Leaf Restaurant on the Beyerskloof Wine Estate is also worth a visit for their famous pinotage burgers. Bringing South African wines and African people together is the BLACC Fest x Langa. 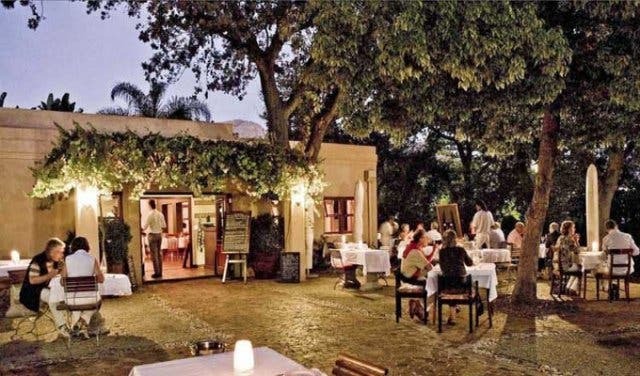 Read more about nightlife in Stellenbosch. 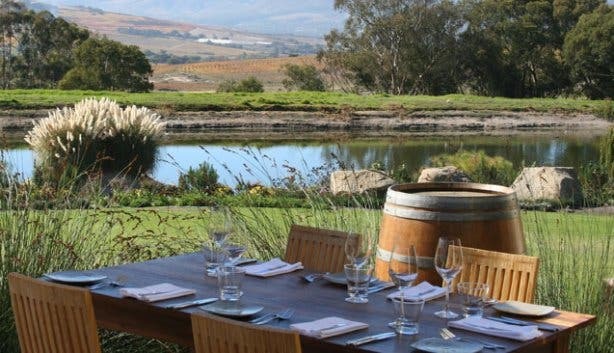 Read our overviews of restaurants at wine estates in Durbanville, Paarl, Franschhoek, Somerset West and Constantia. Subscribe to our newsletter, follow us on Facebook and follow us on Twitter.